How much IRPF and IVA should I be paying as a freelancer in Spain? Q. How much IRPF and IVA should I be paying as a freelance worker in Spain? The IRPF (Impuesto sobre la Renta de las Personas Fisicas) is a progressive, direct income tax which is paid by your client as a withholding tax directly to the Spanish tax office (find out more here). 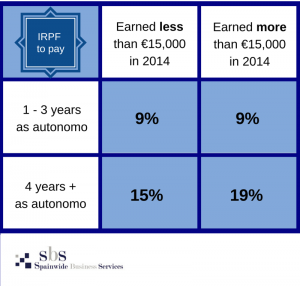 Currently, freelance workers or autonomos should include the IRPF rate of 19%, in the invoice (-19% of tax base) which is paid directly by the client (another registered freelancer or company) to the Spanish tax office. New autonomous workers are able to pay 9% IRPF during the first 3 years of self-employment, and all freelancers who earned less than €15,000 in the previous year will be subject to 15% IRPF. NB. High earners in the first few years of operation would do better to pay 19% IRPF rather than 9% to avoid nasty surprises at the end of the fiscal year. The VAT or IVA (Impuesto sobre el Valor Añadido) is an indirect tax paid by the final consumer ie. your client. The standard rate of VAT is 21% payable to you through your invoice (+21% VAT of total). This money belongs to the Spanish tax office Hacienda and you will then pay the difference between VAT charged and VAT paid out to suppliers, services or products bought in relation to your business activities. That’s why it’s important to keep a record of your business costs. Some services are not VAT applicable whereby you must denote: *exenta del impuesto por el artículo 20 de la Ley de IVA E.g. language classes, medicine, education, exports to countries outside the EU…. Find out more here and please consult a professional for specific cases. Your accountant or gestor will submit your accounts to the tax office every three months to liquidate the IRPF and file the IVA. The yearly Declaracion de la Renta (carried out in March) will then conclude whether you have paid enough income tax compared to the withholding tax (IRPF) depending on a number of factors, and calculate total IVA, and bring your tax account up to date. We recommend consulting a professional for specific matters and to analyse your individual situation feel free to contact us! If you’re already a Spainwide client remember you can contact us on +34 91 547 1254 or email us.